October is National Orthodontic Health Month, and your team at Cartwright Orthodontics would like to take this opportunity to celebrate fall, holidays, and the benefits of orthodontic treatment. For over twenty years Dr. Gary Cartwright has been creating amazing smiles and optimum oral health. Your Pittsburgh orthodontist takes this opportunity to celebrate National Orthodontic Health Month! Teeth that are properly aligned not only create a beautiful smile, they also promote optimum oral health. This is because teeth that are misaligned can be difficult to keep clean, which puts you at a greater risk for tooth decay, wear, fractures, and gum disease. Misaligned teeth can also contribute or cause a painful joint disorder known as TMJ. A healthy, beautiful smile gives patients confidence and good self-esteem that will help them in their personal and professional lives. October also brings with it Halloween. 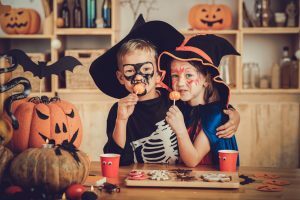 As you dress up to scare and spook your friends, we want to encourage our patients to have fun, yet also be mindful about the treats they’re eating. Patients wearing braces should avoid candy that is sticky, gummy, hard, or chewy, as these treats will tend to pull off or break brackets. Instead, look for goodies that are soft and nut free, such as peanut butter cups or peppermint patties. Another friendly reminder during Halloween treat time is to be sure that you’re brushing properly after enjoying your goodies. The sugar from candy will sit on your teeth and feed the bacteria that cause tooth decay. For patients wearing braces, this means taking your time and carefully brushing around all the brackets and wires, with a focus on areas where the teeth meet the gums and braces attach to the teeth. At Cartwright Orthodontics we treat both kids and adults, and we offer a number of choices for your orthodontic treatment such as clear brackets, metal brackets, and Simpli5 clear plastic aligners. So no matter what age you might be, orthodontic treatment has many benefits to offer, and we have an option that’s right for your needs. Give us a call to schedule your complimentary consultation where we’ll gather information and discuss the possibilities available for you. A beautiful, healthy smile is just a phone call away!